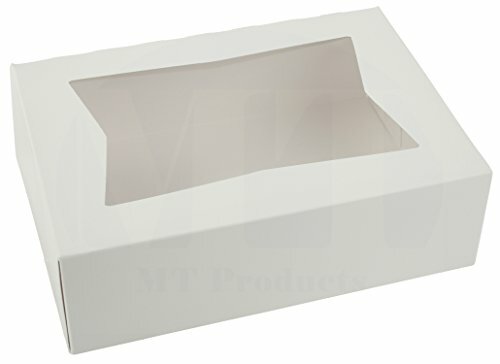 CAKE BOX - Has a double clear window for ideal product display, assembly style is lock corner, color white, made from paper board, made in the USA. CAKE BOARDS- Exact diameter size of cake rounds is 9 7/8 inches, perfect cake base and pizza Board for 10 ,9 and 8 inch cakes, material corrugated cardboard cake rounds, color Kraft/white style, style single wall corrugated, uncoated. ALL ITEMS- Are green / Environmentally friendly. This auto-popup window pie / bakery box is perfect whether you are packaging and selling cakes, pies, cookies, cupcakes, or your muffins. It's made of durable SBS paperboard with a clear window panel, perfect for showcasing your products to potential customers. This bakery box comes flat and preassembled with an auto-popup feature that allows it to fully expand in seconds, eliminating time and effort wasted on assembling traditional fold-and-lock boxes. With it's user-friendly design, this box will help you pack and present baked goods quickly and easily. It also features a crystal clear window panel so you always can see what's inside. TRANSPARENT WINDOW - These boxes feature a transparent window on the top, allowing your customers to glimpse inside easily to see your products. The edges of the window feature an attractive wavy design. DURABLE - These boxes will hold up to the weight of just about anything that will fit in them. They are made of sturdy, thick fiberboard which creates a moderately stiff, high-quality container. 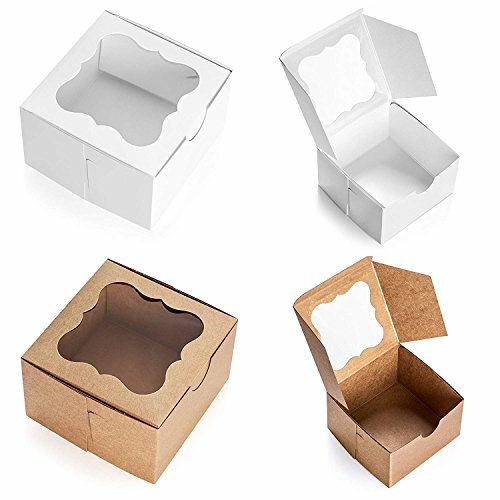 MULTI-PURPOSE - These boxes are the perfect size for small cakes, pies, pastries, donuts, cupcakes, cookies, and other sweets or even non-food gifts. 100% MONEY BACK GUARANTEE - If you're not completely satisfied with these bakery boxes, simply return them for a full refund, no questions asked. We're confident you'll love California Container's Bakery Boxes! ECO-FRIENDLY - These medium 4x4x2.5 inch bakery boxes are made from natural brown paperboard, which uses 30% less fiber than other box materials. Also, the fiber for these brown pastry boxes comes from SFI lumber - lumber collected and reforested utilizing environmentally friendly practices. Further, the plastic window is cellulose based (made from plant material), not petroleum based like most other plastics. TRANSPARENT WINDOW - These organic eco-friendly boxes feature a transparent window on the top, allowing your customers to glimpse inside easily to see your products. The edges of the window feature an attractive wavy design. One and two piece Automatic and Lock Corner Donut Boxes are suitable for a variety of items, depending on the size of the box. Each box is made from either SBS or CCK, both of which are recyclable and compostable where facilities exist. Southern Champion Tray manufactures paperboard packaging products. The company, founded in 1927, is headquartered in Chattanooga, TN. Sturdy corrugated, grease and moisture resistant. 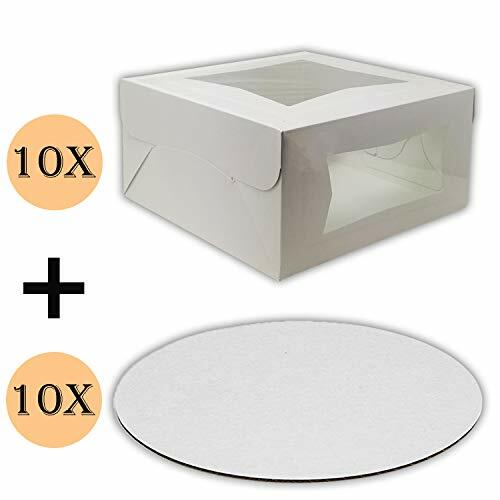 Cake Boxes 8 x 8 x 4 and Cake Boards 8 Inch, Bakery Box Has Double Window, Cake Board is Round, Cake Supplies, 10 Pack of Each. CAKE BOARDS- Exact diameter size of cake rounds is 7 7/8 inches, perfect cake base and pizza Board for 10 ,9 and 8 inch cakes, material corrugated cardboard cake rounds, color Kraft/white style, style single wall corrugated, uncoated. Green Direct has designed and manufactured a new Great item! 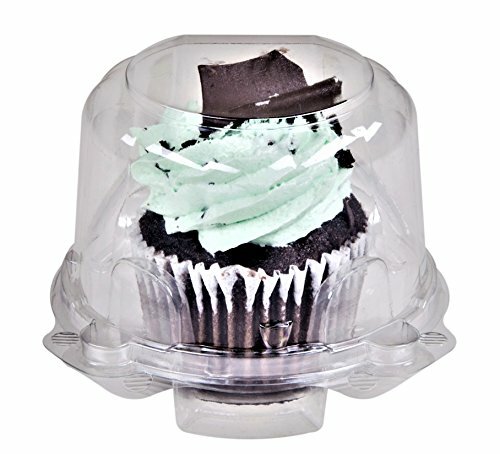 Phenomenal Clear Cupcake Holder with Lid. The Plastic Cupcake Containers are just the super item everyone need to have handy at all times. The durable makeup, and beautiful look makes it the #1 cupcakes containers which you want to have! Green Direct has designed these Cupcakes Boxes so you should be able to insert your decorated cupcakes without them falling around the box and getting a big mess. These plastic cupcake containers are made big enough not to ruin your cupcakes and small enough to neatly fit your cupcakes so they arrive safe and neat to the location you are sending it. Our cupcake holders are designed with an easy to open attached lid, but it is strong enough not to open when not needed. And Many More Treat Ideas. Dimensions: 3.5 Inch X 3.5 Inch X 3 Inch High Just stock up on these Fantastic cupcake tray and have them ready for the upcoming Party, Event, or Gathering. CLICK THE YELLOW "ADD TO CART" BUTTON NOW TO GET YOUR CUPCAKE BOXES AND LET THE PARTY FUN BEGIN! Green Direct Fabulous Cupcake Holder is the ideal item you need to have. Its durable makeup makes it a Great Quality cupcake box, and enables it a shiny, beautiful look and feel. No matter at which occasion you will be using it, it will always make a Gorgeous Statement! For the Upcoming Christmas Holiday it is a Great idea to set as a centerpiece for every guest with your matching theme cupcake. Your Guest will surely be astonished by its beauty! The Clear Cupcake boxes are just the right solution and the Great way to start party preparations. It is the #1 box for everyone. The Phenomenal container is the cupcake favor boxes to fill with any type of simple, decorated, and extravaganza cupcakes. It is a Super idea to prepare at any type of event: weddings, birthday party, baby shower, July 4 Ceremony, or any get together you are planning on making. Want to prepare some delicious, delicate, cupcakes? And make them look trendy, fashionable, and delightful? With Green Direct individual cupcake boxes, you will have your solution without the labor. The Attractive cupcake containers make the cupcake look like a sweet treat! Ready to enhance your table. The cupcake holder box will make your party table or simple Dinner together a Gorgeous Occasion! The Great size of the Cupcake Holder keeps all your cupcakes in place avoiding them from flying around in the Cupcake Container. It is the best cupcake carrier to inlay your simple, or decorated cupcakes to layaway for later or to send to anyone at any time. Whenever you will be sending these Phenomenal individual cupcake boxes filled with your delicious Cupcakes, your family, and friends will be astonished by its Gorgeous and neat look! It is the cupcake container which beautifies your treat! Our plastic cupcake container is BPA Free and Clear so you can insert any type of Cupcake, with any decorations or flavor no matter what your color scheme is. Match your cupcakes in our clear cupcake containers to other party supplies for a Bold and Enjoyable affair! This 8" x 8" x 2 1/2" kraft auto-popup window pie / bakery box is perfect whether you are packaging and selling pies, cakes, donuts, or muffins. This box comes flat and pre-assembled with an auto-popup feature that allows it to fully expand in seconds, unlike assembling traditional fold-and-lock boxes. With the Kraft color and user-friendly design, this box will help you pack and present baked goods quickly and neatly. Made of durable, high-quality kraft paperboard, this convenient, time-saving bakery box is built strong to make sure your items are protected while in transport. It also features a clear window panel so you always know what is inside. Keep your items fresh and secure with this plastic container. 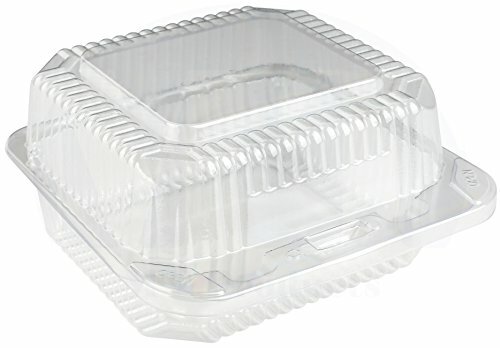 Pack desserts, pastries, salads, and specialty sandwiches in this clear hinged container! Measuring 5" x 5" x 2.75", this container is perfectly sized for a wide variety of products. It is a tremendous addition to delis, supermarkets, cafes, and virtually any other operation that offers take-out. 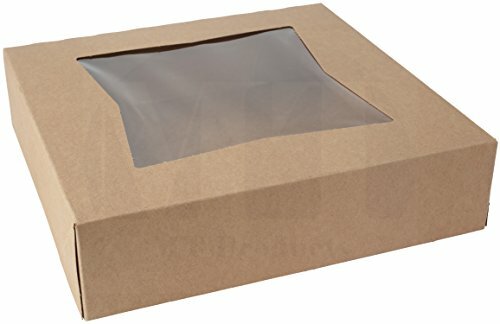 Dimension: 3.54"L x 2.36"W x 6.7"H, brown, pack of 100. Please pay attention to the size, it can hold a donut or few cookies. The bags can hold 12 oz. The top of the bag has wire tabs, so you can fold the top down and bend the tabs to lock it in place. The window makes it easy to see what you have packed inside. The bags have a clear plastic lining which is safe, so it doesn't get grease stains when you put in oily snacks. 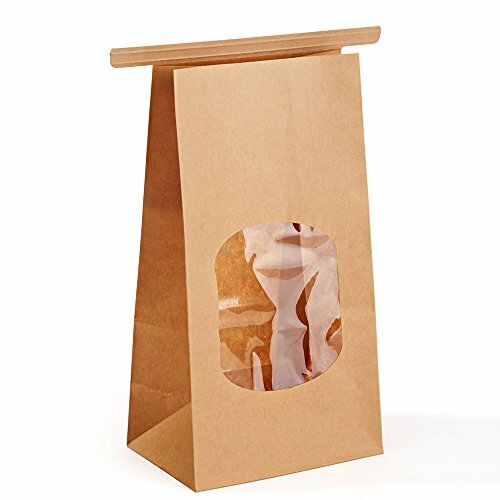 These bags can be a treat bag or gift bag. They are perfect for popcorn, donuts, cookies, candies. Just the right size and easy to decorate for any occasion. 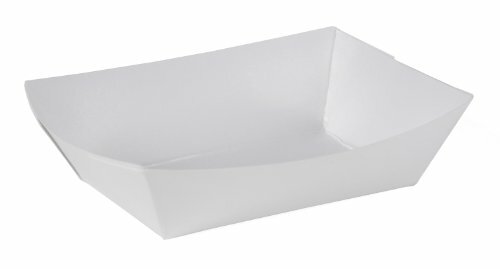 White Food Trays - Hot or cold, spicy or sweet, Southern Champion Food Trays are a great and easy way to serve just about anything. The single-use trays are made of SBS Paperboard and are offered in a wide range of sizes, all of which are microwaveable. In addition, food trays are recyclable and compostable where facilities exist. Southern Champion Tray manufactures paperboard packaging products. The company, founded in 1927, is headquartered in Chattanooga, TN. SCT's pure white food tray is both elegant and crisp making it perfect for: Food Trucks, Restaurants, Weddings, Quincea eras, Graduations, Back Yard BBQ's, Movie Nights, Picnics, Fairs, Carnivals, Themed Parties, Birthday Parties, and any other food-serving event! This sized boat best holds: sauces, kid's snacks, cookies, cake, ice-cream, and single-serve portions of food - 1/4 lb boats are SMALL. Please see our larger sizes if necessary. 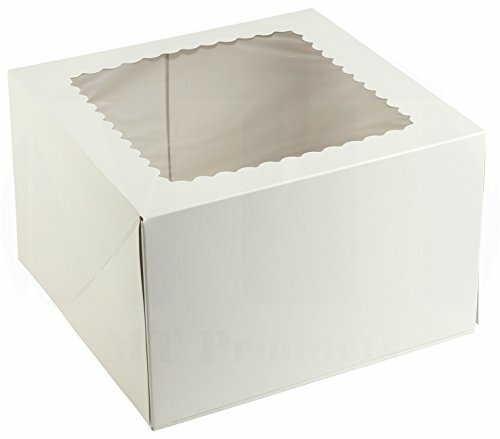 Show off your sweet treats with this 6" x 6" x 3" white cake / bakery box. This bakery box is a great way to offer your smaller baked goods, like cookies and muffins. It's also perfect for small cakes and pies. Thanks to a simple design, this bakery box provides endless possibilities to fulfill your packaging needs. This 8" x 8" x 2.5" auto-popup window pie / bakery box is perfect for packing and selling cakes, pies, cookies, cupcakes, or muffins. It's made of durable SBS paperboard with a clear window panel, perfect for showing off your products to potential customers. This bakery box comes flat and preassembled with an auto-popup feature that allows it to fully expand in seconds, eliminating time and effort wasted on assembling traditional fold-and-lock boxes. It also features a clear window panel so you always can see what's inside. Looking For A Set Of Durable, Practical & Beautiful Bakery Boxes For Your Cakes? Want to protect your cakes and cupcakes from damage? 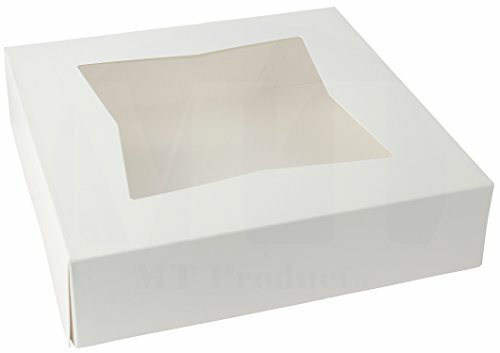 Need a cost-effective and superior-quality set of cake boxes for your caf , bistro or bakery? Now you don't have to settle for cheaply-made and low-quality cardboard boxes anymore, since the ultimate set of bakery storage containers is finally here! Introducing The Cuisiner Cake Boxes With Window 25-Pack! 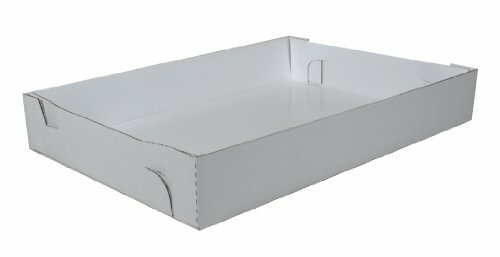 Why struggle with cheap bakery cake boxes that tear easily and provide no protection whatsoever, when you can finally have thicker, sturdier and more convenient bakery boxes? 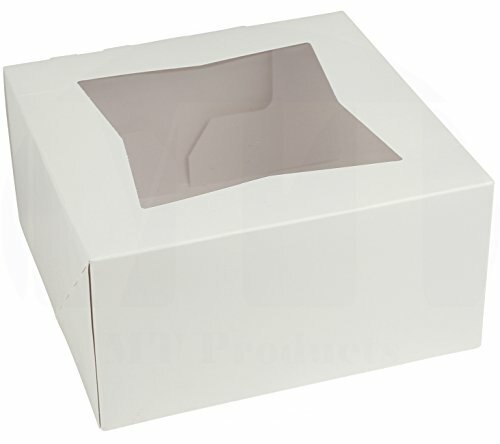 Our 12" x 12" x 6" cupcake boxes are designed with great attention to detail, in order to help you store, package, ship and promote your baked goods like never before! Why Choose The Cuisiner Cupcake Bakery Boxes? Our bakery boxes are 0.54mm thick,so you can rest assured that they can endure any abuse without skipping a beat! ELEGANT DISPLAY WINDOW -the stylish transparent display window will catch everyone's attention and offer them a sneak-peak of your mouth-watering cakes! The Cuisiner cupcake boxes with window are so reliable that they can be used by both professional bakers, restaurants and bistros for takeouts as well as home chefs who want to impress everyone at the next school bake sale! Click"Add To Cart" NOW & Finally Own The Most Versatile & Durable Bakery Boxes! HERE'S HOW YOU CAN MAKE YOUR CAKES & LARGE CUPCAKES STAND OUT with the most elegant,sturdy and beautiful baker boxes! Unlike regular cake boxes, our 12"x 12"x 6" superior-quality cardboard boxes feature a handy transparent display window, which will make your baked delights irresistible to everyone! And since the Cuisiner set contains 25 premium bakery containers, you can cover your needs for months! STURDY DESIGN WILL PROTECT YOUR DESSERTS from damage! 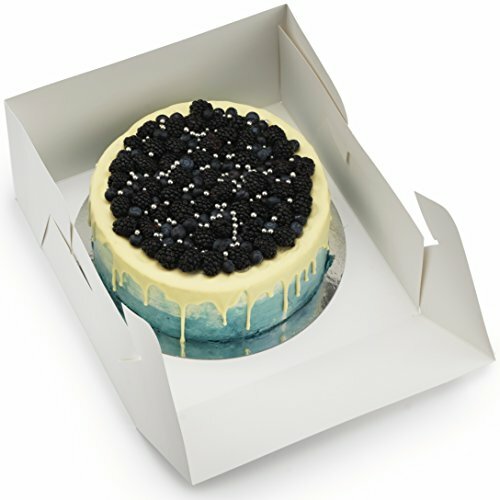 While other cheaply-made pastry boxes are just 0.42mm thick, our superior-quality bakery boxes with window are 0.54mm thick, so rest assured that your cakes will be safe and sound! If you are sick and tired of bakery boxes that tear easily and ruin your donuts, then the Cuisiner bake sale packaging multipack is exactly what you need! MAKE A GREAT FIRST IMPRESSION WITH THE CLEAR DISPLAY WINDOW and offer your potential customers a glimpse of your sweet and sugary desserts, pies and cakes! 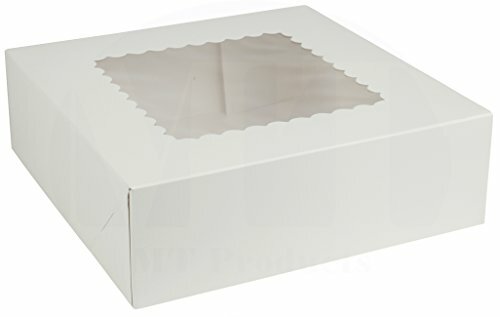 Perfect for bake sales, small caf s, bakeries, bistros, donut shops and pastry shops, our cake boxes with window are the ultimate packaging solution for both professional and amateur bakers! And the best part? They are super easy to assemble and store! NOT JUST FOR CAKES! UNLEASH YOUR IMAGINATION! Even though the Cuisiner cake cardboard boxes are ideal for baked goodies, you can use them to store, package and display anything you want, from jewelry to candles and from homemade toys to flowers! You name it! No matter what you choose to store, our durable and practical gift boxes will make your life easier and 100% fuss-free! What are you waiting for? 100% SATISFACTION OR YOUR MONEY BACK! We know exactly how hard it is to find high-quality bakery boxes online, since there are hundreds of cheaply-made alternatives. That's exactly why we decided to offer you a peace-of-mind guarantee! If you're not 100% thrilled with our professional-grade bakery boxes with window, we promise to offer you a prompt and full refund. No questions asked! 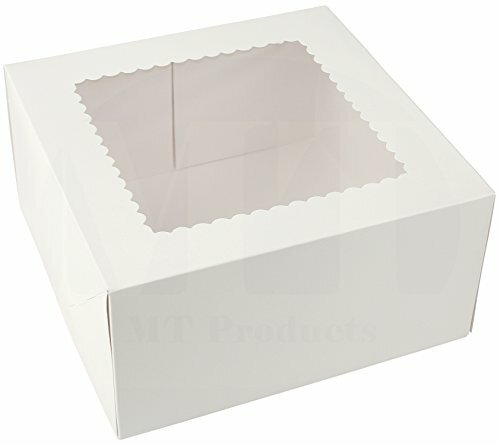 This 9" x 9" x 2.5" auto-popup window pie / bakery box is perfect whether you are packaging and selling cakes, pies, cookies, cupcakes, or your muffins. It's made of durable SBS paperboard with two clear window panels, perfect for showcasing your products to potential customers. This bakery box comes flat and preassembled with an auto-popup feature that allows it to fully expand in seconds, eliminating time and effort wasted on assembling traditional fold-and-lock boxes. With it's user-friendly design, this box will help you pack and present baked goods quickly and easily. It also features a crystal clear window panel so you always can see what's inside.